This training programme is organised by the International Ocean Institute in partnership with the State Enterprise on Caspian Sea Issues at the President of Turkmenistan and at their behest. Further information may be obtained by contacting IOI HQ on ioihq(at)ioihq.org.mt. 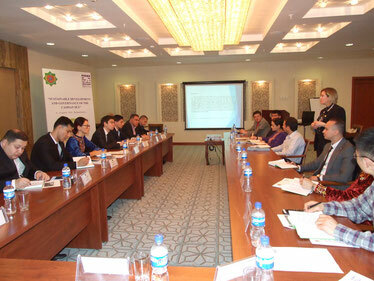 The seventh consecutive course focussing on Caspian Sea issues came to a fruitful completion last month. This course forms part of the IOI’s capacity building programmes on ocean governance and is offered with co-founding partner the State Enterprise on Caspian Sea Issues at the President of Turkmenistan (SECS). The course was formally launched by IOI HQ Managing Director Antonella Vassallo and SECS Chairman Myrat Atajanov on the 4th March alongside Dr Iouri Oliounine, Director of the Training Programme, who further introduced the participants to the concepts and structure of the course. This year 19 participants from the countries surrounding the Caspian Sea (Turkmenistan, Azerbaijan, Kazakhstan, IR Iran and Russia), and one participant from China attended the course. The diverse experience in issues of Caspian Sea management, research and policy of the participants further enriched the project work undertaken during the course. Detailed information about the course was given in the latest edition of the IOInforma 02/19 available for download from the Documents & Publications section (0219 issue). The eighth IOI Training Course on Sustainable Development & Governance of the Caspian Sea is scheduled to be held in March in Turkmenbashi, Turkmenistan.